I wish I could review Laura a thousand times because she deserves all of the love and praise in the world. There aren’t enough words to describe how incredible she is - she is a true artist, 100% professional and dependable, and one of the sweetest, most fun, and delightful people to spend the day with. For mine and my husband’s engagement shoot, she did my hair and makeup (at no charge, and it was AMAZING) and drove 2 hours north to Turkey Run to capture the most magical shots. We got married last weekend, and she already had the most jaw-droppingly gorgeous previews ready for us the morning after the wedding! I have never received more compliments on photos in my entire life - all of our friends and family were completely floored by her work, and I find myself staring at our photos almost every day just because they make me so happy and evoke the most wonderful memories. She captures so much emotion and feeling in her images - every photo is a timeless work of art. I could keep going about how amazing she is - I can’t wait to have her capture more big moments of my life down the road!! Laura has to be one of the most talented and creative wedding photographers, hands down. Our experience with Laura was phenomenal from beginning to end. She was professional, responsive, and fully understood our vision for our photos and executed it in a way that was truly above and beyond. She traveled to D.C. for our engagement shoot and captured us and the city perfectly. At our wedding, she seamlessly maneuvered throughout the night, allowing us to be fully immersed in the experience while she captured the most gorgeous candid shots. 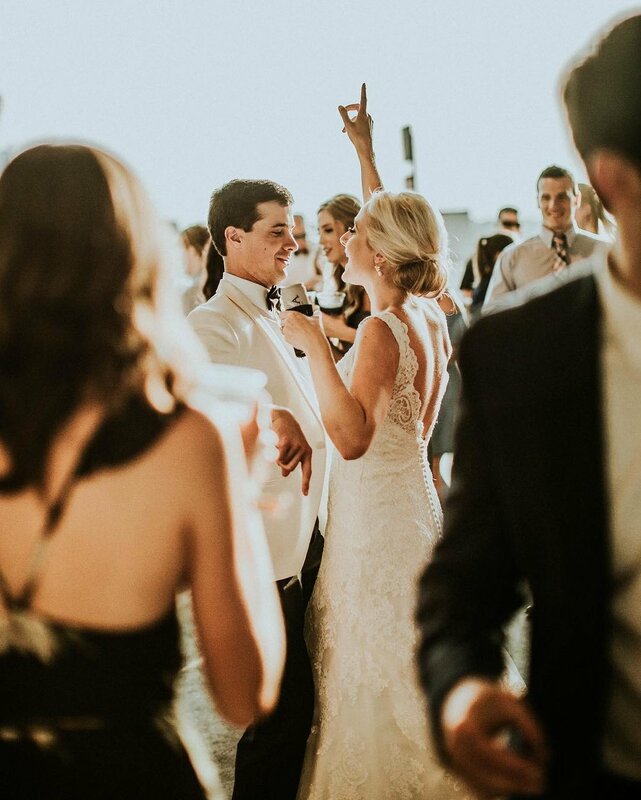 Laura is the perfect choice if you’re looking for stylish, modern, and authentic wedding photography and videography. She was a dream to work with and I can’t recommend her enough. Laura and her husband were so great to work with. I wanted a photographer who would take charge and give directions to make sure everything went smooth, this was Laura’s specialty. Laura was on time to start the day and kept the day and timeline moving along smoothly. Our pictures were beautiful and I honestly feel like she captured us and our day absolutely perfectly! I could go on and on about Laura’s talent and professionalism but I feel her pictures speak for themselves. We are truly thankful for her and we will cherish our wedding photos forever! I can’t recommend Laura and her husband highly enough!! As an out of state bride, it was easy to book her and discuss everything over the phone. She was very organized and inspired confidence. She did an excellent job placing and positioning us for the best angle (we needed that!) I love that they each have their own unique style of photography — you get a really dynamic view of your big day! The photos are timeless, romantic, and everything we wanted. BOOK HER! If I could leave more stars I would! I by chance found Laura on theknot.com and she and her husband were the BEST thing in my wedding planning! Laura was very accommodating, answered all of my questions, understood my frustrations and exceeded my expectations. Every picture from our engagement and wedding is a piece of art that I could gaze at all day! First meeting Laura she was like a friend I’ve always had and we just picked up where we left off. Ricky was so fun and easy to work with as well and captured the most beautiful moments on video from our wedding and I’m just in love with everything they did. After our wedding they had become friends to us and that is one of the best parts. I recommend Laura and Ricky to every person I know getting married and I recommend them to anyone reading this. They are simply amazing! From a vendor standpoint, Laura was the absolute best decision we could’ve made. I came across Laura’s photography on Instagram long before we were ever engaged and knew she was who I’d want to capture our day when the time came. Her photos are gorgeous and she makes you feel so comfortable throughout the whole process. We can’t recommend her enough and are looking forward to her capturing the next stages in our lives! While searching for photographers for my wedding I had reached out to many photographers and two that did not have my original date open recommended Laura. I am SO happy they did. I cannot even express the gratitude I have for her and Richard. They were amazing to work with. She listened to how we wanted our story to be told. Neither of us were very comfortable in front a camera but she helped us get out of our shells and really captured “us”. She is very professional and personable. We had an unexpected issue with our venue and had to change our wedding date. Laura worked with us to find a new date that worked for her and the venue within the hour even though it was late. Every single person that was either a part of our photos or have seen our photos have all said “wow” and have complimented them. I will be using her for all the future photos. One of my bridesmaids is now using her for her wedding this upcoming year and I can’t wait to work with her again as I am a bridesmaid. I HIGHLY recommend. A dreamy engagement session at Leonard Springs Nature Park. For Katie & Austin’s session we went back to where their story engagement story began - Story Inn. A beautiful golden hour engagement session in downtown Indianapolis. Stunning cherry blossoms, cool street art and beautiful Georgetown homes served as our backdrops. It was so fun exploring Washington DC with these this awesome couple. A cozy Christmas in home session.